Vichai Sriprasert and his daughter Jennifer visit vendors at a rice shop in Nigeria, the largest Thai rice importer in Africa. The region continues to have great market potential as a number of Thai rice companies have offices there and some have been approached by local governments to invest there in milling, processing and even growing rice. African countries have become a major destination for Thai rice as purchasing volume surged substantially to more than 4.6 million tonnes last year out of 10 million tonnes in total exports. Vichai Sriprasert and his daughter Jennifer visit vendors at a rice shop in Nigeria, the largest Thai rice importer in Africa. The region continues to have great market potential as a number of Thai rice companies have offices there and some have been approached by local governments to invest there in milling, processing and even growing rice. "They seek know-how and need skilled people to take part in post-harvest activities such as processing and milling rice," said Wanlop Pichpongsa, deputy managing director of Capital Rice Co.
Capital Rice, Thailand's largest rice exporter, had been approached by Stallion Group, West Africa's largest business conglomerate, to form a venture to operate a rice mill and processing plant in Nigeria. African countries buy various types of Thai rice but parboiled rice remains the favourite grain for consumers on the West coast of the continent. The rice requires a specific production process that is known by just a few Thai companies. 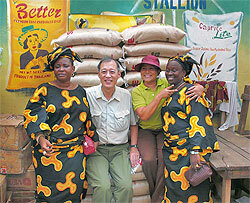 Capital Rice has not yet decided to invest, but Mr Wanlop feels it is an interesting project. "For the time being, I would like to strengthen our brands in African markets," said Mr Wanlop, whose company exports 100,000 tonnes of rice to Nigeria per year, mainly to Stallion, which controls several leading consumer brands including 'Caprice' of Capital Rice Co.
African countries are also interested in growing rice, particularly Nigeria, and companies have been approached by a few governments, said Vichai Sriprasert, president of Riceland International Co. This is an opportunity to exploit the expertise of Thai rice farmers and help them escape from long-term poverty, he said. "Don't get me wrong, I do not want to promote rice investment in foreign countries to compete with Thai rice. My intention is to encourage Thai investors to explore opportunities abroad, notably in potential markets such as Africa," said Mr Vichai, also former president of the Thai Rice Exporters Association. "Thai farmers were trapped in a cycle of poverty for a long time and one reason is most of them have limited farmlands," he said. "With approximately 15 million rice farmers and 60 million rai of available land, each has only 4 rai for farming." In properly irrigated areas, yields might be as high as 1,000 kilogrammes of paddy per rai and could earn about 10,000 baht for each tonne of paddy sales, or just 40,000 baht per year, which is pretty low for a best-case scenario, according to Mr Vichai. Crop damage would lower those earnings considerably. "The prolonged poverty is mainly because of land limitation and wouldn't it be good if one country offered plenty of land for farmers to grow rice?" According to Mr Vichai, Nigeria permits foreigners to grow rice and operate other rice-related businesses such as milling and processing in order to lessen dependence on rice imports and build up self-sufficiency in food. Nigeria allows foreigners to lease farmlands for up to 99 years and to fully control rice investment projects. Demand for rice in Nigeria is huge at about 4 million tonnes per year for the 150 million population. Domestic supply of only 2 million tonnes means the country imports the rest, and 300,000 to 400,000 tonnes are normally bought from Thailand. Last year's global fuel crisis drove the volume from Thailand to more than 840,000 tonnes, an 158% rise year-on-year. "Nigeria has quite a similar climate to Thailand and grows some of the same crops such as sugarcane, maize, and a variety of rice," he said. Mr Vichai entered Nigeria 30 years ago and brought technical processes from the United States to make parboiled rice. His company sold more than 100,000 tonnes last year, or one-fourth of total export shipments. He suggests the Thai government and local companies spearhead the movement for farmers to plant rice in Nigeria. It's an opportunity for Thailand to use the knowledge that made it the finest rice producer and the world's biggest rice supplier, he said. "If we don't go, there are other countries ready to make investments such as India, a leading rice exporter," Mr Vichai added.